EcoPick, Hand made guitar picks and plectrums for nylon guitar. EcoPicks are competitively priced at $25 each or $99 for 5 including free worldwide delivery! EcoPicks are made out of 100% ethical natural buffalo horn and all are cut, shaped and bevelled entirely by hand. Although careful attention is taken to try and keep tolerances as close as possible the very nature of production means slight inconsistancies may occur from pick to pick, please be mindful of this when ordering multiple quantities. Just as the tyre of your car is the all important contact between your vehicle and the asphalt so your pick forms the vital link between you and your string. Every nylon player knows how thin, brittle and poorly shaped nails will be the ruination of tone and technique and all who have ever experienced acrylics or the like will have surely benefitted from a superior meatier tone and a more confident and fluid technical performance…the difference in fact is humongous! Well it is the same with picks - too thin and it sounds weak, too thick and it sound dull, wrongly shaped and it can result in a poor attack and a lack of fluidity and speed. 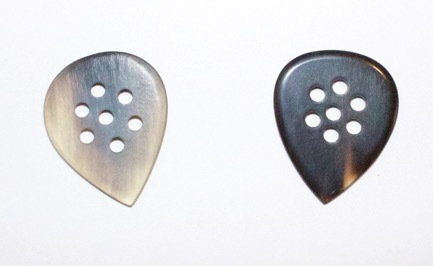 So with this in mind I set about making picks that would perform perfectly for my style of playing…and now I am proud to offer these in limited quantity to discerning players searching for that ‘Holy Grail’ of feel and tone to eek any advantage they may possibly acheive out of their playing!